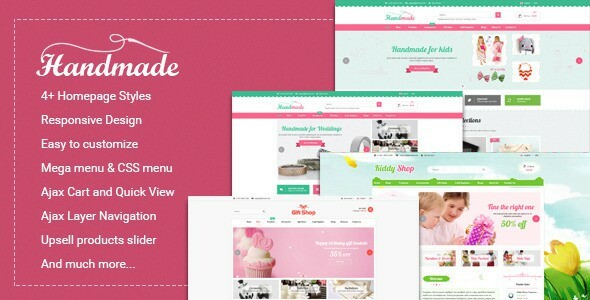 Handmade is a Magento shopping theme with an exquisite clean design. Handmade is a perfect choice for clothing store, digital store, watch store, luxury jewelry and accessories store. Include extensions: SM Basic Product, SM Shop By, SM Quickview , SM CartPro , SM Mega Menu, SM Deal, SM Listing Tabs, SM Camera Slider, SM Searchbox pro, SM Categories. Item Reviewed: Handmade Multipurpose Responsive Magento Theme 9 out of 10 based on 10 ratings. 9 user reviews.